diploma-uitreiking op 24 juni jongstleden. met een 4,2 (van maximaal 5) punten. Dit is de laatste zin uit een artikel in The Wall Street Journal van 21 maart 2017 over het vertrouwen in de Amerikaanse president. Ook tijdens onze opleiding ‘Strategisch Relatiemanagement’ die nu op de hotelschool wordt gegeven, sprak Monica Bakker van Comenius Leergangen over vertrouwen en met name het verschil tussen functioneel en moreel vertrouwen. Functioneel vertrouwen gaat over de zekerheid van vaste procedures; moreel vertrouwen heeft te maken met integriteit. Het verschil daartussen is goed zichtbaar bij het vertrouwen in banken. De meeste mensen hebben functioneel vertrouwen in banken: ze vertrouwen ze hun geld toe omdat ze ervan uitgaan dat de bank dat geld niet kwijt raakt. Maar veel mensen hebben tegenwoordig geen moreel vertrouwen meer in de banken, omdat ze tijdens de recente crisis hebben ervaren dat banken voornamelijk geïnteresseerd zijn in hun eigen gewin. Ook bij relatiemanagement gaat het om vertrouwen, echter voor organisaties voor wie relaties alleen functioneel of instrumenteel zijn, is het lastig een netwerk op te bouwen. Dat je dat vertrouwen winnen ook nog eens oprecht en echt moet menen, maakt relatiemanagement nóg complexer. Het is aan de mensen binnen een organisatie om relaties aan te gaan die nét iets persoonlijker zijn dan de functie vereist. Om niet alleen effectieve tijd te besteden aan zakelijke onderwerpen, maar ook eens te vragen naar iemands welbevinden, een keer koffie te gaan drinken zonder agenda. Als je de relatie bouwt op een moment dat er even geen materiële winst te behalen is – en dat oprecht en welgemeend doet – kun je later gemakkelijker een beroep doen op die persoon. Maar het schuren tussen enerzijds het instrumentele van het relatiemanagement en anderzijds de persoonlijke kant van relaties die vertrouwen en integriteit vraagt, blijft een constant dilemma voor mensen in organisaties. Meer informatie over de opleiding ‘Strategisch Relatiemanagement’: relationshipmanagement.eu/postgraduate. Het artikel in The Wall Street Journal: wsj.com. 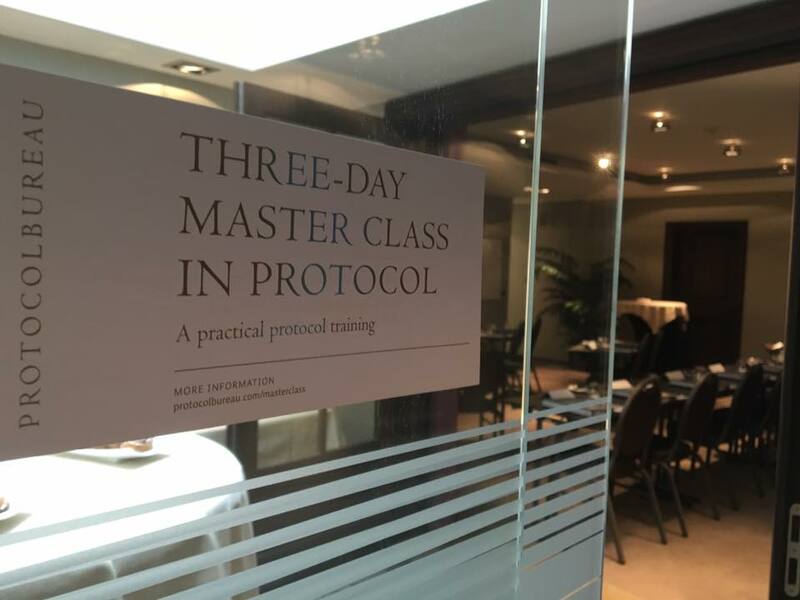 Last week 13 professionals started following the postgraduate ‘Strategic Relationship Management’ at the Hotelschool The Hague university in Amsterdam. In 6 days given over 3 months the participants learn everything about relationship management on a strategic, tactical and operational level given by 5 faculty members and 5 guest lectures. The programme is also followed by 28 hotelschool-bachelor-students and last Thursday a joint-session took place (see photo’s). The students were introduced to the professionals, and vice-versa; Where are the professionals working? For what reason did they decided to follow the programme? What are the challenges they face in their work? This review was published in the ‘PDI-POA: Protocol Officers Association Newsletter, December 2016′. The review was submitted by Kathleen Montalvo, member of PDI-POA and working at the office of the Executive Director, Biodesign Institute, Arizona State University, Tempe, Arizona, USA , Arizona. As a member of the Education Committee, one of the best things I get to do is update our Member Resource list. Which means I get to read the latest and greatest books in protocol and etiquette. Recently, I had the pleasure of reading a wonderful book entitled An Expert’s Guide to International Protocol, Best Practices in Diplomatic and Corporate Relations by members Gilbert Monod de Froideville, the former Master of Ceremonies of Queen Beatrix of the Netherlands and Director of the consulting company Protocol International and Mark Verheul the Head of Protocol of the City of The Hague. An Expert’s Guide to International Protocol is a must for every Protocol Officer’s bookshelf. The authors discuss everything from precedence to proper attire for men and women. Each chapter ends with a delightful essay or interview from a variety of experts sharing their experience within the world of protocol. You will read an interview with Mr. Martin van Pernis, former President of the Board of Siemens, the Netherlands, and a brief essay by Professor Olivier Arifon, Professor at the Université libre de Bruxelles in charge of the chair in communication, “Diplomatic language and formal language: A code with a double meaning,” to name a few. These fascinating insights provide a real sense of the far reaches protocol has within many industries and organizations throughout the world. The diagrams throughout the book are the best I have ever seen. For those of us who get their left and right and right and left mixed up, you will love the diagrams for seating whether at a dining table, conference table or in a car. Proper flag placement – don’t worry, turn to Chapter 4. Needless to say, my book is full of Post-its marking each for quick reference. The holidays are just around the corner, so add this book to your wish list. The Protocol Officers Association (PDI-POA) is an international association of Protocol professionals dedicated to promote the protocol profession and raise awareness of its central role in business and diplomacy through education and networking. Membership in the Association is open to professionals in the field of protocol who currently serve, or have served in the past, as protocol officers or managers for any level of government (federal/national, state/province, county, city or military) museums or cultural institutions, universities and colleges (public or private), corporations or international trade organizations.